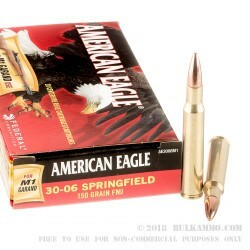 An excellent deal on a proven round for the .30-06 Springfield that is suitable for hunting (check your local regulations first to see if FMJ is suitable for hunting in your area), target practice or paper punching whenever you don’t want to spend the normal cost on rounds for your beloved ‘ought Six. The ammunition here is marketed specifically for the M1Garand and it isn’t just hype really. The casings take into effect the violent case extraction and the specific lockup of the firearm. The FMJ gets good lockup in the rifling of the M1 and the feeding and reliability in these firearms with this ammunition is exceptional. 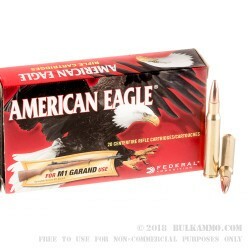 Sure you could use a more expensive ammunition to get the same results in your Garand, but why waste the money when you have a very reliable round right in front of you in the form of the American Eagle M1 Garand ammunition in .30-06. A 150 grain weight projection is capable of 1MOA out of the Garand, but the more than adequate ammunition is more specifically made for reliable ignition, feeding and extraction so you can enjoy range day with your Military rifle. Great Ammo For My Old Mr Garand 500 Yards Head Shot One Round! Q: My question is: What is a Boxed Primed Brass. Or what is a box primer? Thanks. T.J.
Posted On: 11/13/13 By: T. J. M.
A: Both of these questions are directly related to eachother. From a shooter's standpoint, you will not notice any difference in appearance or performance between Boxer primed ammo and berdan primed ammo from the factory. Berdan primed could be considered an opposite of Boxer primed ammo, or "the other one". There is also Rimfire, commonly seen in .22LR ammo, though this is considerably different it is not comparable to the two above. Rimfire will not have any other variations. Boxer primed brass will require boxer primers. Berdan primed brass will require berdan primers. The main noticeable feature between these two would be the opening (flash hole) in the brass where the primer sits (primer pocket). If you were to remove the primer on a boxer primed rifle or pistol round, you would see one hole almost center going through the brass. This is a flat surface on the other side of the primer that we do not see when inspecting ammunition that is ready to fire. If you were to remove the primer from a berdan primed round, you would see two holes instead of one. These two holes would be smaller than the one boxer hole. Additionally they would be pointing outward towards the wall of the brass and this surface is more of a dome than flat. Looking through the bottom of a round (if you removed the primer) it would be like looking at the ceiling inside a sports dome/arena etc. 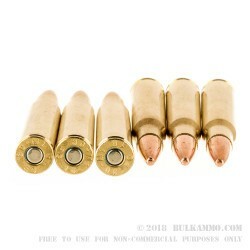 A majority of brass ammunition will feature this Boxer primed brass as manufactured by Remington, Winchester, Federal among others. 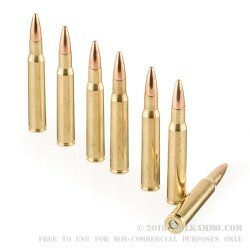 Berdan brass will be found on steel cased ammo such as Tula, Wolf and Brown Bear. It would be a safe bet to assume all steel cased ammo is berdan and all brass cased ammo is boxer primed. There will be exceptions. Those who reload ammunition will require the use of Boxer primed brass and boxer primers. There are different tools used for the reloading of berdan though it is uncommon enough to the point it is hardly worth mentioning.